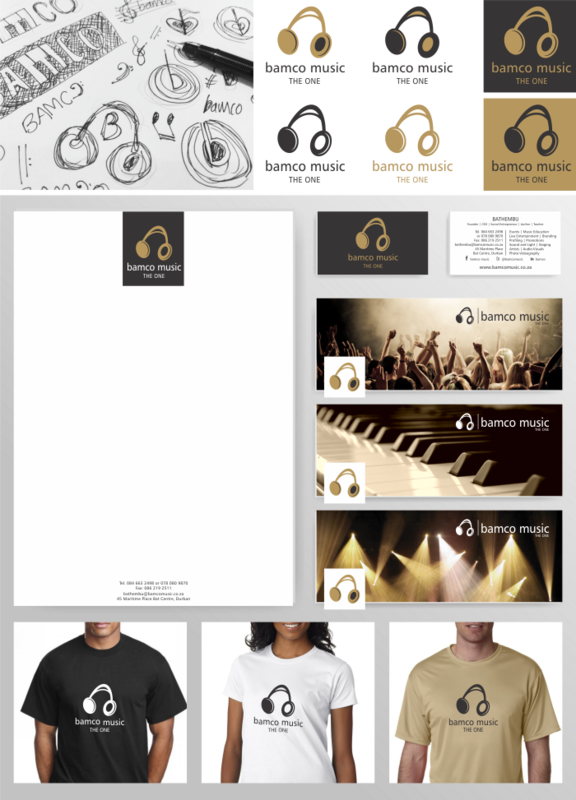 Today we're sharing a rebranding project for Bamco Music. Their previous logo was 'home made', had too many colours (red, blue, green and shades thereof), common images, an unsuitable font, and didn't reflect the professionalism of the company and its principles. Bamco is a business of multi-services including sound and lighting, eventing, live entertainment and music education. The owner wanted something clean, classy and fresh that could be easily reproduced in a single colour. A while ago we designed a CD label for the client and used black and gold in the design and he really liked it so decided to carry it through into his new branding. We've used a custom drawn headphone icon because it also looks like 2 music notes so works to cover all the segments of Bamco's business repertoire. It's market appropriate, clean and classy and puts Bamco Music into the league it should be. Our orignal sketches, the final developed logo, stationery, Facebook covers and some branded elements are show below.